Period 1 started off with few scoring chances for either side, Niagara had about 5 shots ad Yale added some chances. Niagara got on the board at 14:48 when Kelsey Welch got it by Ladiges during a scrum at the front of the net. That would be the extent of the scoring in the period and Niagara went into the intermission with a one goal lead. The shot differential was 10-7. The first period reached 1:37 when Yale’s Danielle Moncion was called for roughing. The Bulldogs started killing the penalty, only to have Jenna Ciotti called for tripping 2:26. 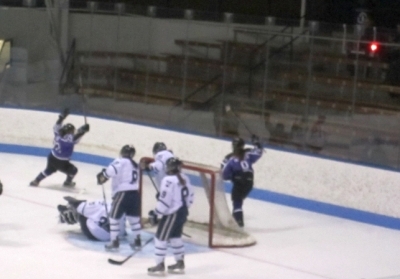 20 seconds before the first penalty was set to expire, Kathleen Bortuzzo of the Purple Nights fed Jessica Hitchock on the other side of the net and she shot it in with Kelsey Gunn also picking up an assist at 3:09. Yale successfully killed off the rest of the second penalty though for while the Purple Eagles kept picking up shots, Yale did not manage to get one. Prior to the next penalty of the game the shot differential was 20-7 Niagara. At 10:33 Ciotti was called for Holding the Stick but the Bulldogs killed the penalty successfully. However at 13:10 Kalli Funk shot it by the keeper at close range assisted by Kayla Raniwsky and Amy Helfrich. Niagara was up 3-0. Erica Owczarczak went into the box at 15:21 for tripping giving the Bulldogs a power play opportunity, but at 16:25 Lauren Davis was also sent to the box for body checking. Neither team would score during the penalties, but at 18:36 Emily Desmeules was called for holding and Patricia McGauley served the penalty putting Yale down a skater for the rest of the period. The Purple Eagles went into the 2nd intermission 3-0, Niagara also had 20 shots in the period, to Yale’s 4 for a total of 30-11. When period 3 began, Yale was still on the penalty kill but that ended without incident. At 1:49 Heather Grant was called for Hooking and another penalty kill followed. Yale survived this one as well though still down by 3. At 3:59 Kristin Richards of Niagara was called for tripping. Yale went on a rare power play and made it count with a power play goal from Jackie Raines, assisted by Zupon and Mock at (though this seems to be a change in the scoring from at the time.) Nonetheless the puck went over Ryplanski and into the net cutting the deficit to 2. However at 5:37 Daniela Dal Colle put it into the net assisted by Richards and Welch. The shot differential with 8 to play was 34 to 16, but Niagara would score the only other of the game was Welch netted it at 12:49 assisted by Dal Colle. Two other Niagara penalties called in the game would not result in goals and that was the extent of the scoring. Editor’s Note: Based on eyewitness account checked against official boxscore. Women’s Volleyball: Hartford and CCSU go 5 sets.